Small volumes of anti-ABCB1 antibody vial(s) may occasionally become entrapped in the seal of the product vial during shipment and storage. If necessary, briefly centrifuge the vial on a tabletop centrifuge to dislodge any liquid in the container`s cap. Certain products may require to ship with dry ice and additional dry ice fee may apply. The membrane-associated protein encoded by this gene is a member of the superfamily of ATP-binding cassette (ABC) transporters. ABC proteins transport various molecules across extra- and intra-cellular membranes. ABC genes are divided into seven distinct subfamilies (ABC1, MDR/TAP, MRP, ALD, OABP, GCN20, White). This protein is a member of the MDR/TAP subfamily. Members of the MDR/TAP subfamily are involved in multidrug resistance. The protein encoded by this gene is an ATP-dependent drug efflux pump for xenobiotic compounds with broad substrate specificity. It is responsible for decreased drug accumulation in multidrug-resistant cells and often mediates the development of resistance to anticancer drugs. This protein also functions as a transporter in the blood-brain barrier. Mutations in this gene are associated with colchicine resistance and Inflammatory bowel disease 13. Alternative splicing and the use of alternative promoters results in multiple transcript variants. 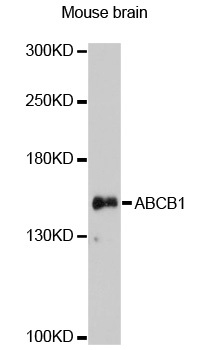 Western blot analysis of extracts of mouse brain, using ABCB1 antibody. 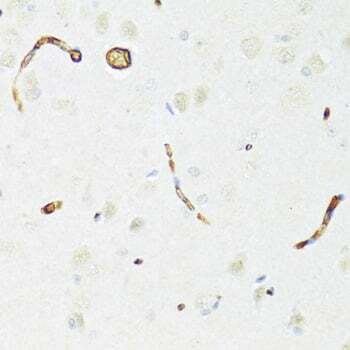 Immunohistochemistry of paraffin-embedded rat brain using ABCB1 antibody. NCBI/Uniprot data below describe general gene information for ABCB1. It may not necessarily be applicable to this product. 1. NFV and LPV restored CFZ activity at therapeutically relevant drug levels and thus represent ready-to-use drugs to be tested in clinical trials to target ABCB1.